When Gertrude Stein wrote the poem Sacred Emily, which begins with the first line (A) “Rose is a rose is a rose”, the first “Rose” she was referring to was the name of an actual person. 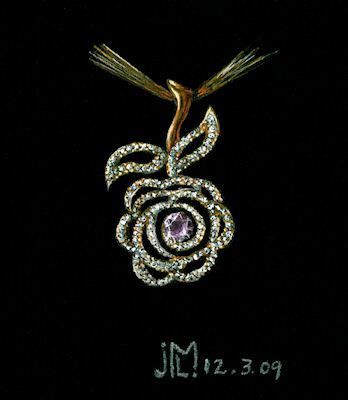 I find it a fitting line for my Rose Pendant rendering above. My first rose is the rose gold metal. I love that the pinkness of the gold needs little more embellishment, save for white diamonds and one pink tourmaline, to convey the color of the bloom. And, like Gertrude Stein’s intended meaning, this pendant is what it is.